05/22/2016: Upgraded to the latest version of React (v15.0.1). React is a library, not a framework. Unlike client-side MVC frameworks, like Backbone, Ember, and AngularJS, it makes no assumptions about your tech stack so you can easily integrate it into a new or legacy code base. It’s often used to manage specific areas of an application’s UI, rather than the entire UI. Since Components are defined in a hierarchical order, you don’t have to re-render the entire DOM when a state changes. Instead, it uses a Virtual DOM that only re-renders the individual Components after the state has changed, at blazingly fast speeds! Be sure to review the Getting Started guide and the excellent Why did we build React? blog post from the official React documentation. 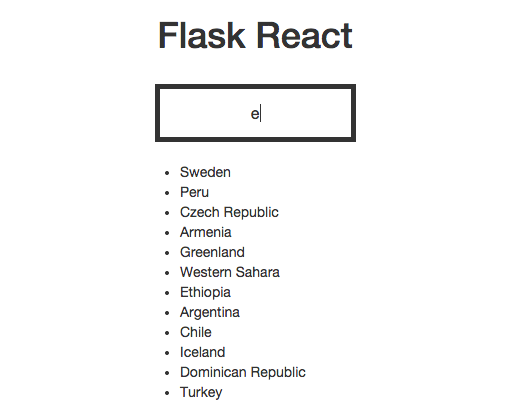 Let’s start with what we know: Flask. Let’s look at a simple Component to get our feet wet. We are going to add this JSX script to our hello.html. Take a minute to check it out. We created a Component by calling createClass(), then assigned it to the variable realPython. React.createClass() takes a single argument, an object. Inside this object we added a render() function that declaratively updates the DOM when called. Next comes a return value of <h2>Greetings, from Real Python!</h2>, in JSX, which represents the actual HTML element that will be added to the DOM. Finally, ReactDOM.render() instantiates the realPython Component and injects the markup into a DOM element with an ID selector of content. Refer to the official docs for more info. Notice how we did not add jQuery since it is not required for React. That’s it. Run the Flask development server and check out the results in the browser at http://localhost:5000/hello. Make sure you have Node and npm installed before moving on. npm is another package manager used to manage Node modules. Unlike PyPI/pip, the default behavior of npm is to install dependencies at the local level. The -g flag is used to override that behavior to install bower globally since you will probably use bower for a number of projects. For more on the bower.json and the init command, check out the official documentation. Run bower install <package_name> --save for each package (the --save flag adds the dependencies (name and version) to the bower.json file.). Update the bower.json file directly with each dependency (again, name and version) and then run bower install to install all dependencies from the file. You should now see the “project/static/bower_components” directory. Test out the app to make sure it still works.